On today`s midmorning the next important milestone was reached in firm history: The eagerly awaited test operation of the wind farm in Saulces-Champenoises in the region of Champagne-Ardennes started without any difficulties. 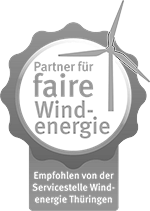 As early as 2004, on behalf of its brand Ven`Sol`R, the Leipzig-based enterprise Green Energy 3000 GmbH developed a wind farm with a total output of 20 MW in close cooperation with the CCPA (Communnauté de Communes des Crêtes Préardennaises). By a special civic participation model, close cooperation with the community and the involvement of the local economy, the project received appreciativeness and consent. With the creation of a master plan to use wind power the region has taken a pioneering role in France. After the setting and the calibration of the power plant during the present test operation the 8 wind turbines of the world leading brand Vestas are predicted to produce about 59 million kWh per annum. As a result approximately 12,500 households can be supplied with energy. 50 km away of the wind farm, the affiliate Green Management 3000 GmbH is going to open up a branch in Reims to manage the project optimally. From there all future wind farms and solar parks in the region are planned to be maintained, monitored and supervised. Manageress Heike Liebscher stresses that this will be on a budget-friendly, professional and flexible base.